Exchange student, Saharath Phaetrangsee, more commonly known as Copter, said goodbye to RHS on Monday, April 30th to return to his home in Thailand. 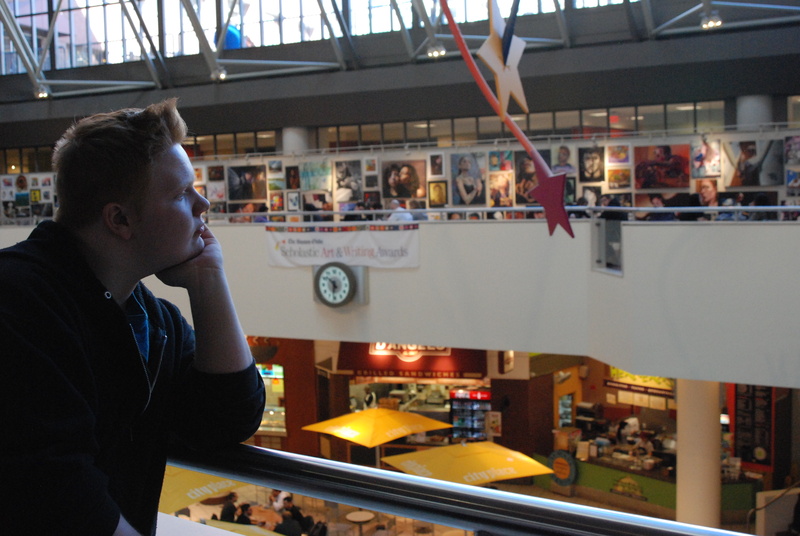 We wish him a fond farewell and hope that he enjoyed his time at Rockland High School! You can follow this link to see our story about Copter which appeared in the Veritas. 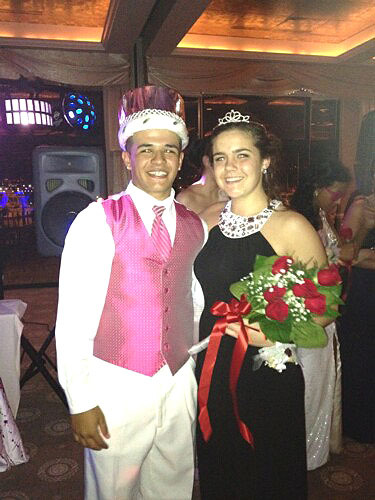 Alex Mejia and Danielle Oliver were king and queen of last year’s junior prom. Proms for juniors and seniors are just around the corner. The Junior Prom is May 16, 2013 at The Red Lion Inn in Cohasset, Massachusetts and should be on sale next week. The prices for the Junior Prom tickets are eighty dollars each. 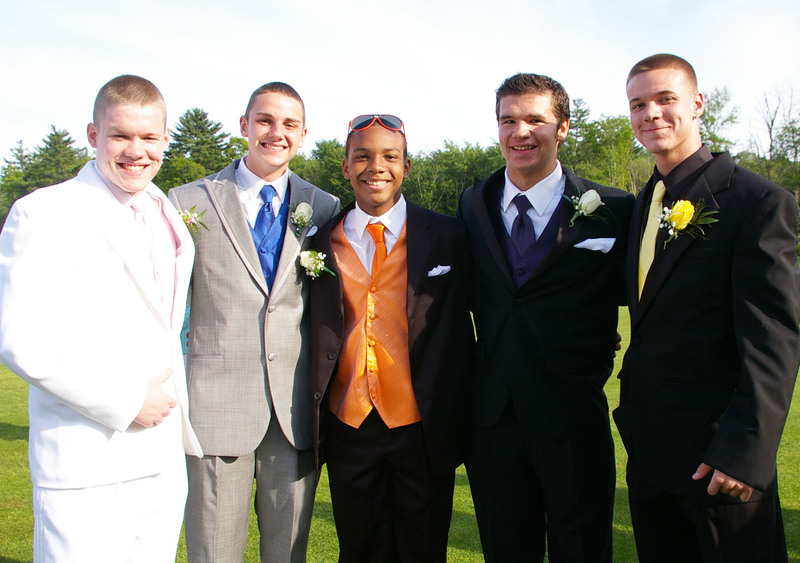 The Senior Prom is May 29, 2013 at Indian Pond in Kingston, Massachusetts. Tickets are going to be on sale all this week at all three lunches. It is sixty five dollars for one ticket and one hundred and thirty dollars a couple. Sign ups also include a chance to pick your tables for the prom. It is eight couples per table. For the seniors it is their last chance to have a great dance together as a class and celebrate before graduation which is on May 31, 2013 at 7:00 pm under the “Friday Night Lights” at the Rockland High School Football Stadium. For juniors, it is their first big dance to dress up and have a good time. For both the seniors and the juniors they all have many exciting things to look forward to as their school year comes to an end. Seniors and Juniors: Be sure to buy your tickets when the time comes! You don’t want to miss out on your prom! Amy Warner’s speech was judged best last night at the annual Spellman Oratorical Contest held in the Lecture Hall as part of the Rockland Public Schools’ Arts Festival. Amy was the recipient of $1100 as the first place winner. The topic for this year’s Spellman Oratorical Contest was Blood is Thicker than Water: Family as an Exploration of the Human Story. 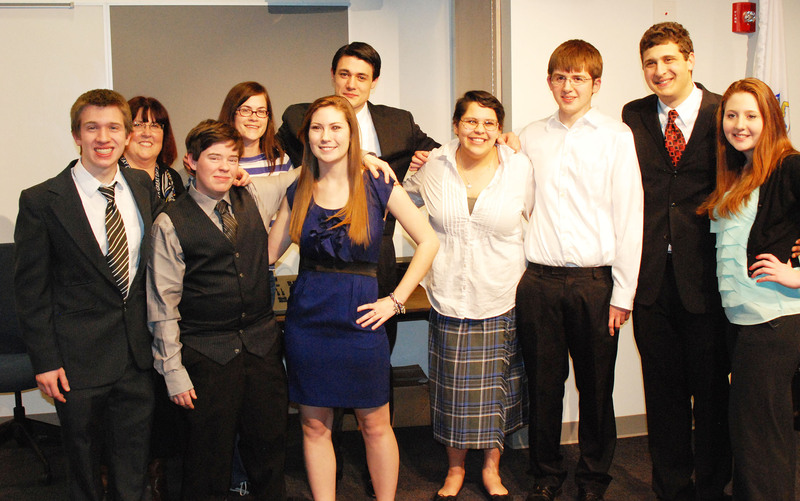 Eight seniors competed for $2750 in prize money. This year’s speeches were articulate, original, provocative, and even a little bit humorous. Prize money was awarded from a trust established by the late Francis Cardinal Spellman of Whitman in memory of his mother, Ellen Conway Spellman. Joe Palana came in second, winning $700; third place went to Shannon Doyle who won $500; Dan Phipps came in fourth winning $200; Lydia Guerrero was fifth and won $100; and Kevin Bailey, Chris Carchedi, and Alexis Hogan tied for honorable mention, each winning $50. Congratulations to these senior students and good luck to them in their future scholastic endeavors! 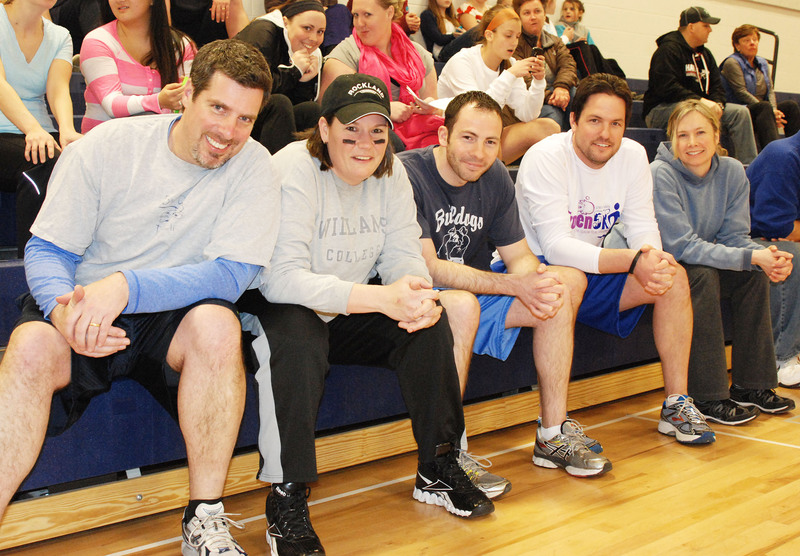 Mr. Cron, Mrs. McGonnigal, Mr. MacAllister, Mr. Johnson, and Mrs. Linehan had a great game of dodgeball. The student team, the Purple Cobras, wearing custom made purple t-shirts, won Rockland’s High’s 1st Annual Dodgeball Tournament. The tournament, a fundraiser for the Stephen P. Sangster Scholarship Fund, was held on Thursday night, March 28th at 7 pm in the gym. The Purple Cobras, made up of Sean Roche, Jonathan Turner, Matt Nicholson, Alex Mejia, Angelica Calderon and Brittany Starkey cruised through the tournament until coming up against the Rockland Middle School teachers’ Dangerous Dodgers team. The Dangerous Dodgers featured Mr. Chuck McDonald, Ms. Diana Mitchell, Mr. Ronnie Ricciarelli, Mr. Steven Capone, Ms. Lawrie Donovan and Mr. Ryan Austin. Rockland High students were clearly excited to throw some balls at some of their favorite teachers, or even their not so favorite teachers. “I can’t wait to throw balls at teachers,” said senior Sean Roche, who is known throughout the school for his strong throwing arm. For the full story on the participants in the tournament follow this link. For more info on the tournament and some great pictures, check out The Veritas print edition on sale April 11th during lunches and at the Arts Festival. We also have more pictures in our Photo Gallery. “It was an interesting field trip. I was astonished by the amount of talent that was in the room,” said Meghan Lee. Among the group of RHS art students, five of the students had won awards that varied from honorable mentions, silver keys and a gold key. 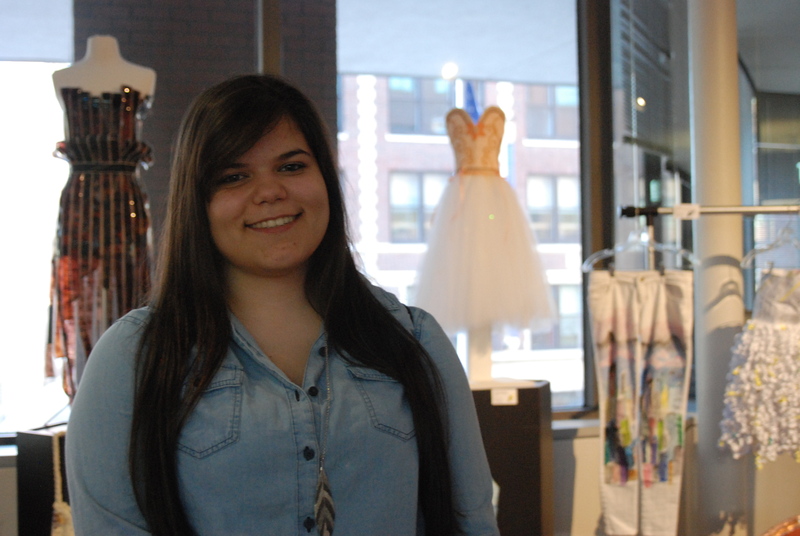 Georgia Panagiotidis, a grade 11 student, was awarded the first gold key in fashion design in Rockland High School history. 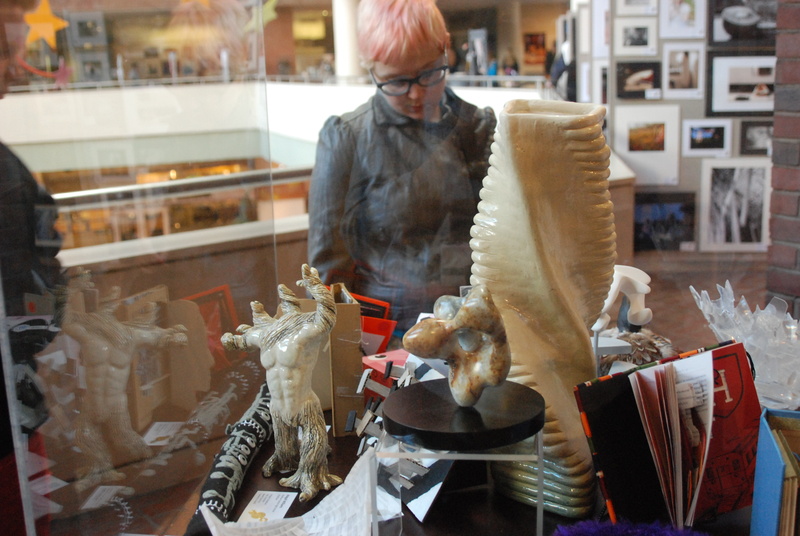 Emily Williams checking out the sculptures. Rockland’s artists will be showcasing an art show of their own. 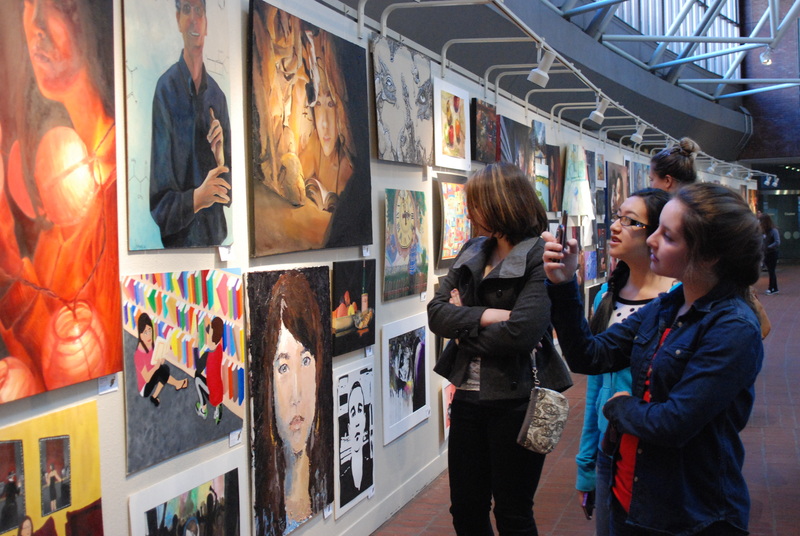 The annual Rockland Public School’s Arts Festival will be held on April 11, 2013. 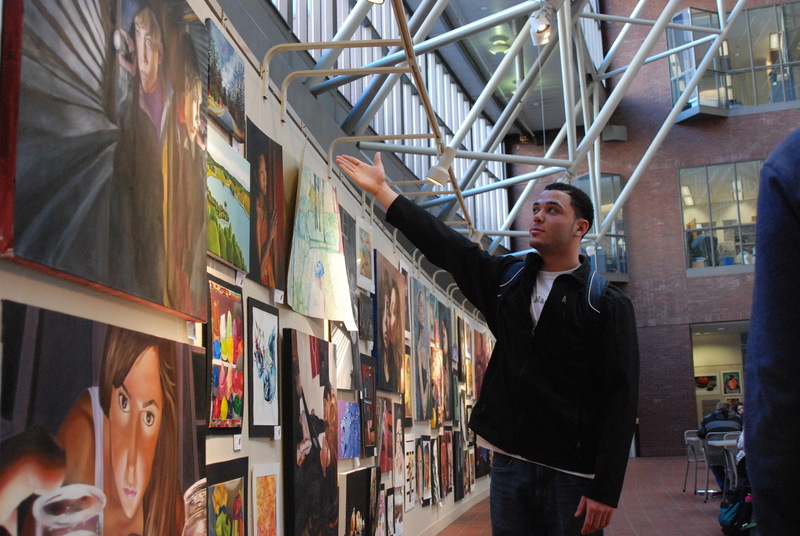 This show will display works of art work from all Rockland students, including the middle school and elementary schools. This will be taking place in the middle school gymnasium. Also included will be projects by Consumer Science students and Technology / Woodshop classes. Georgia Panagiotidis at the Globe Show. In the background is her Gold Key entry in Fashion Design. The fall cheerleading team traveled to Orlando, Florida on March 20th to the 24th for The American Open National competition. There they performed well, well enough to be the second best team in the United States! Congratulations ladies! The team had won the Regionals, State, and all New England Championship before heading down to Florida. The cheerleaders dressed up for dinner. The cheerleaders finished second but manage to smile after completing a great season. Click on any photo to see slide show. Thanks to Mrs. Jeanine Reardon and Mrs. Kim Fontaine Reardon for photos.